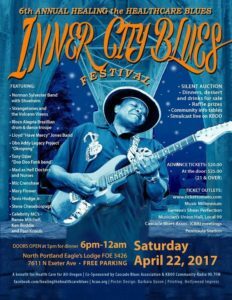 The 2017 Inner City Blues Festival returns to the Eagles Lodge Saturday, April 22. 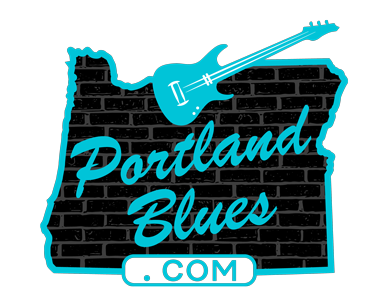 Originally in the 1980s and 1990s, the festival was a community  event for various civil rights and social justice causes. Since its return six years ago it has been a major supporter of the cause Health Care For All Oregon, the campaign to bring universal health coverage to everyone (www.hcao.org). This year’s event once again brings a sensational line-up of all-star musicians and dancers, featuring: Norman Sylvester Band; Obo Addy legacy Project “Okropong;” Mary Flower; Tevis Hodge Jr.; Mic Crenshaw; Sheohorn; The Strange Tones with The Volcano Vixens; Boco Alegria; Steve Cheseborough; Lloyd “Have Mercy” Jones; Tony Ozier “Doo Doo Funk;” Mad As Hell Doctors, Nurses & Interns!. Special emcees for the night will be Paul Knauls, Renee Mitchell, and Ken Boddie.